Should we blame the creative originators of fake news, conspiracy theories, disinformation and click-bait hype? Or, should we blame the media for disseminating, spinning and aggrandizing these stories for their own profit or political motives? Or, should we blame us — the witless consumers. I subscribe to the opinion that all three constituencies share responsibility — it’s very much a symbiotic relationship. James Warren chief media writer for Poynter has a different opinion; he lays the blame squarely at the feet of gullible and unquestioning citizens. He makes a very compelling argument. Perhaps if any educated political scholars remain several hundred years from now, they’ll hold the US presidential election of 2016 as the culmination of a process where lazy stupidity triumphed over healthy skepticism and reason. 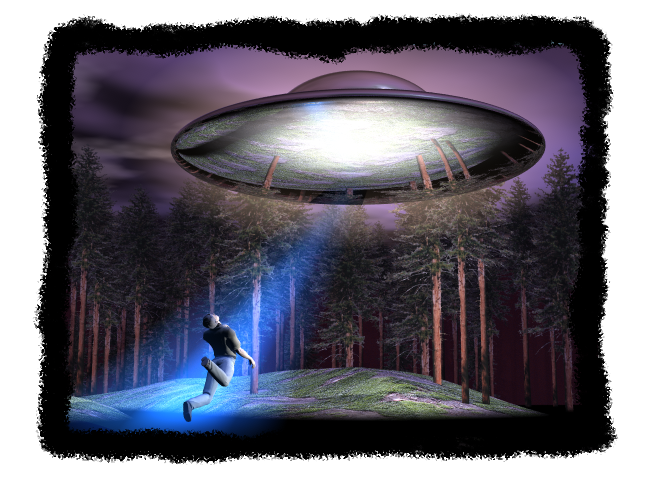 Image: Artist’s conception of an alien spacecraft tractor-beaming a human victim. Courtesy: unknown artist, Wikipedia. Public Domain. Occam’s razor (or Ockham’s razor) is a principle from philosophy popularized by 14th century philosopher and logician William of Ockham. Put simply, it states that if there are two or more explanations for a possible occurrence, the simplest explanation is usually the best. That is, the more assumptions required for a possible hypothesis, the less likely is the explanation for that hypothesis. While Occam’s razor has been found to apply reasonably well in the philosophy of science and more generally, it is not infallible. So, in this 21st century, it’s time to give Occam’s razor a much needed, fresh coat of paint. Further, it also requires an update to make it 100 percent accurate and logically water-tight. Ascertain the stupidest possible scenario that can be reconciled with the available facts and that answer is likely correct. Unfortunately I can’t lay claim to this brilliant new tool of logic. Thanks go to the great folks over at Talking Points Memo, Josh Marshall and John Scalzi. Read their insightful proposal here. 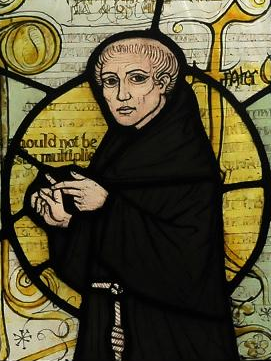 Image: William of Ockham, from stained glass window at a church in Surrey. Courtesy: Wikipedia. Creative Commons CC BY-SA 3.0. Before the age of Facebook and Twitter if you were to say something utterly stupid, bigoted, sexist or racist among a small group of friends or colleagues it would, usually, have gone no further. Some members of your audience may have chastised you, while others may have agreed or ignored you. But then the comment would have been largely forgotten. This is no longer so in our age of social networking and constant inter-connectedness. Our technologies distribute, repeat and amplify our words and actions, which now seem to take on lives of their very own. Love it or hate it — welcome to the age of social networking justice — a 21st century digital pillory. Say something stupid or do something questionable today — and you’re likely to face a consequential backlash that stretches beyond the present and into your future. Just take the case of Justine Sacco. Another sign that some humans are devoid of common sense comes courtesy of New York. The state is designating around 100 traffic rest stops as “Text Stops”. So, drivers — anxious to get in a spontaneous email fix or tweet while behind the wheel — can now text to their thumbb’s content without imperiling the lives of others or themselves. Perhaps this signals the demise of the scenic rest stop, only to be replaced by zones where drivers can update their digital status and tweet about reality without actually experiencing it. This is also a sign that evolution is being circumvented by artificially protecting those who lack common sense. Yesterday, New York Governor Andrew Cuomo announced a new initiative to stop drivers from texting on the road—turn rest areas into “Text Stops” and put up signage that lets people know how many miles they’ll have to hold off on tweeting that witty tweet. 91 rest stops, Park-n-Ride facilities, and parking areas along the New York State Thruway and State Highways will now become special texting zones for motorists who may not have noticed the wayside spots before. WBNG (a local news site) lists the locations of all 91 Text Stops. In total, 289 new signs will alert motorists of the new texting zone locations. The signs advertising the re-purposed zones will be bright blue and will feature messages like “It Can Wait” and the number of miles until the next opportunity to pull over. The state is cracking down on texting in terms of fines as well—the penalty for texting and driving recently increased to $150 and five points on your license, according to BetaBeat. WBNG also notes that in the summer of 2013, New York saw a 365 percent increase in tickets issued for distracted driving. Read the entire article here, but don’t re-tweet it while driving. Human intelligence is a wonderful thing. At both the individual and collective level it drives our complex communication, our fundamental discoveries and inventions, and impressive and accelerating progress. Intelligence allows us to innovate, to design, to build; and it underlies our superior capacity, over other animals, for empathy, altruism, art, and social and cultural evolution. Yet, despite our intellectual abilities and seemingly limitless potential, we humans still do lots of stupid things. Why is this? “EARTH has its boundaries, but human stupidity is limitless,” wrote Gustave Flaubert. He was almost unhinged by the fact. Colourful fulminations about his fatuous peers filled his many letters to Louise Colet, the French poet who inspired his novel Madame Bovary. He saw stupidity everywhere, from the gossip of middle-class busybodies to the lectures of academics. Not even Voltaire escaped his critical eye. Consumed by this obsession, he devoted his final years to collecting thousands of examples for a kind of encyclopedia of stupidity. He died before his magnum opus was complete, and some attribute his sudden death, aged 58, to the frustration of researching the book. Documenting the extent of human stupidity may itself seem a fool’s errand, which could explain why studies of human intellect have tended to focus on the high end of the intelligence spectrum. And yet, the sheer breadth of that spectrum raises many intriguing questions. If being smart is such an overwhelming advantage, for instance, why aren’t we all uniformly intelligent? Or are there drawbacks to being clever that sometimes give slower thinkers the upper hand? And why are even the smartest people prone to – well, stupidity? It turns out that our usual measures of intelligence – particularly IQ – have very little to do with the kind of irrational, illogical behaviours that so enraged Flaubert. You really can be highly intelligent, and at the same time very stupid. Understanding the factors that lead clever people to make bad decisions is beginning to shed light on many of society’s biggest catastrophes, including the recent economic crisis. More intriguingly, the latest research may suggest ways to evade a condition that can plague us all. Modern attempts to study variations in human ability tended to focus on IQ tests that put a single number on someone’s mental capacity. They are perhaps best recognised as a measure of abstract reasoning, says psychologist Richard Nisbett at the University of Michigan in Ann Arbor. “If you have an IQ of 120, calculus is easy. If it’s 100, you can learn it but you’ll have to be motivated to put in a lot of work. If your IQ is 70, you have no chance of grasping calculus.” The measure seems to predict academic and professional success. Various factors will determine where you lie on the IQ scale. Possibly a third of the variation in our intelligence is down to the environment in which we grow up – nutrition and education, for example. Genes, meanwhile, contribute more than 40 per cent of the differences between two people. This variation in intelligence has led some to wonder whether superior brain power comes at a cost – otherwise, why haven’t we all evolved to be geniuses? Unfortunately, evidence is in short supply. For instance, some proposed that depression may be more common among more intelligent people, leading to higher suicide rates, but no studies have managed to support the idea. One of the only studies to report a downside to intelligence found that soldiers with higher IQs were more likely to die during the second world war. The effect was slight, however, and other factors might have skewed the data. Alternatively, the variation in our intelligence may have arisen from a process called “genetic drift”, after human civilisation eased the challenges driving the evolution of our brains. Gerald Crabtree at Stanford University in California is one of the leading proponents of this idea. He points out that our intelligence depends on around 2000 to 5000 constantly mutating genes. In the distant past, people whose mutations had slowed their intellect would not have survived to pass on their genes; but Crabtree suggests that as human societies became more collaborative, slower thinkers were able to piggyback on the success of those with higher intellect. In fact, he says, someone plucked from 1000 BC and placed in modern society, would be “among the brightest and most intellectually alive of our colleagues and companions” (Trends in Genetics, vol 29, p 1). This theory is often called the “idiocracy” hypothesis, after the eponymous film, which imagines a future in which the social safety net has created an intellectual wasteland. Although it has some supporters, the evidence is shaky. We can’t easily estimate the intelligence of our distant ancestors, and the average IQ has in fact risen slightly in the immediate past. At the very least, “this disproves the fear that less intelligent people have more children and therefore the national intelligence will fall”, says psychologist Alan Baddeley at the University of York, UK. In any case, such theories on the evolution of intelligence may need a radical rethink in the light of recent developments, which have led many to speculate that there are more dimensions to human thinking than IQ measures. Critics have long pointed out that IQ scores can easily be skewed by factors such as dyslexia, education and culture. “I would probably soundly fail an intelligence test devised by an 18th-century Sioux Indian,” says Nisbett. Additionally, people with scores as low as 80 can still speak multiple languages and even, in the case of one British man, engage in complex financial fraud. Conversely, high IQ is no guarantee that a person will act rationally – think of the brilliant physicists who insist that climate change is a hoax. It was this inability to weigh up evidence and make sound decisions that so infuriated Flaubert. Unlike the French writer, however, many scientists avoid talking about stupidity per se – “the term is unscientific”, says Baddeley. However, Flaubert’s understanding that profound lapses in logic can plague the brightest minds is now getting attention. “There are intelligent people who are stupid,” says Dylan Evans, a psychologist and author who studies emotion and intelligence.